However, the length might vary depending upon your waist size. See pattern below. To make the belt you will need to add about 8 to 10 inches to your belt measurement, depending on how long you want the end of the belt to hang. Then, ch with your hook and yarn until you reach this length. To make a 45″ long belt, follow the pattern below, otherwise adjust according to your measurements. Row 1: ch 136 (or to your personal measurement), dc in second ch from hook and in each ch across. Finish off. 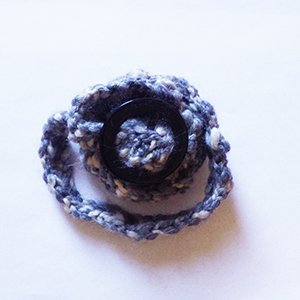 Sew the button about 2″ from one end of your crocheted belt. Then, button the belt onto your buckle. This entry was posted on Saturday, March 2nd, 2013 at 12:00 AM by Emilee Gettle	and is filed under Free Crochet Patterns. You can follow any responses to this entry through the RSS 2.0 feed. You can skip to the end and leave a response. Pinging is currently not allowed. Hi Emilee, this sounds too easy to make. thanks what a great idea! Can’t tell what makes it interchangeable – or what the pattern looks like…Can you please post a photo of what the belt looks like – like unrolled and laid out? Thank you for sharing so many patterns with us! That is awesome and it is appreciated. Hi Pat! It looks like Emilee’s belt attaches to the center of the button (there is a shaft running down the center). Then the other end is weaved through one side of the button, over the shaft, then through the other side of the button.